Situated in San Casciano dei Bagni, this apartment building is 0.1 mi (0.1 km) from Val di Chiana and within 12 mi (20 km) of Archaeological Museum of Sarteano and Sarteano Castle. Rocca di Radicofani and Santa Maria dei Bianchi Oratory are also within 12 mi (20 km). 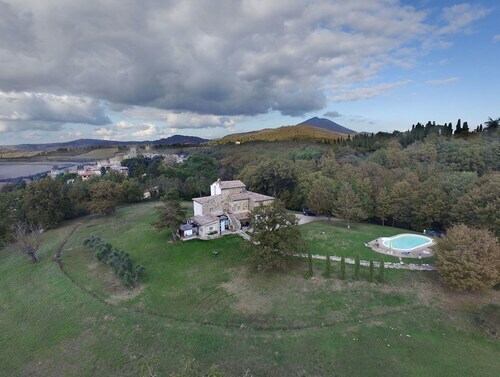 Situated in San Casciano dei Bagni, this farm stay is 0.1 mi (0.1 km) from Val di Chiana and within 12 mi (20 km) of Santa Maria dei Bianchi Oratory and Archaeological Museum of Sarteano. Sarteano Castle and Chiusi Cathedral are also within 12 mi (20 km). Situated in San Casciano dei Bagni, this hotel is 0.1 mi (0.1 km) from Val di Chiana and within 12 mi (20 km) of Archaeological Museum of Sarteano and Sarteano Castle. Rocca di Radicofani and Santa Maria dei Bianchi Oratory are also within 12 mi (20 km). How Much is a Hotel Room in San Casciano dei Bagni? Hotels in San Casciano dei Bagni start at $82 per night. Prices and availability subject to change. Additional terms may apply. With 15 places to stay in and around San Casciano dei Bagni, those traveling here are able to find the best option. At the moment, Travelocity's easy-to-use booking guide features 15 places to stay within a 6-mile (10-kilometer) distance of San Casciano dei Bagni's downtown. Spend a day within walking distance of the vibrant heart of San Casciano dei Bagni. Hotels in the vicinity include Fonteverde and Hotel Sette Querce. 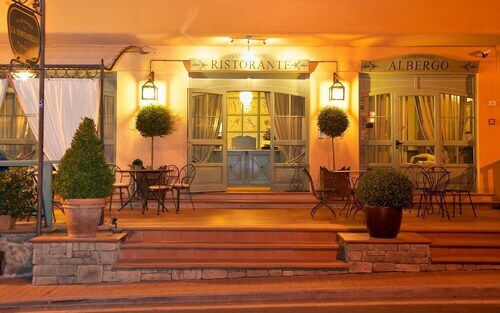 One of the relatively small number of budget hotels in San Casciano dei Bagni is the Argento. 16 miles (26 kilometers) away from the center of San Casciano dei Bagni, you can find the Adler Thermae Spa & Wellness Resort. Alternatively, the Hotelito Lupaia is positioned 18 miles (29 kilometers) away. Two other Travelocity-listed alternatives in this area are the Il Tosco as well as the Poggio Piglia. If you have time left, adventurous explorers should venture to the other parts of the Tuscany region. Get to know Tuscany's ruins, castles and traditional villages. You should also make the time to enjoy its rural landscapes, beaches and coastal plains. Popular activities in this particular area of Italy include snowboarding, skiing and snow shoeing. Val d'Elsa is 55 miles (86 kilometers) northwest of San Casciano dei Bagni and is home to Archeological and Collegiate Church Museum and Torre Rognosa. If you want to get to Val d'Elsa, check out the Tenuta Di Mensanello and Torraccia di Chiusi. Or stay in Val d'Orcia, 17 miles (27 kilometers) to the northwest of San Casciano dei Bagni, where you can choose between the Hotel Osteria Dell Orcia and Locanda del Loggiato. If you visit Val d'Orcia, set aside some time to explore the Collegiate Church of San Quirico and Palazzo Chigi. When watching stadium sport is what you love, pay a visit to Stadio Artemio Franchi - Montepaschi Arena, situated 40 miles (67 kilometers) to the northwest of San Casciano dei Bagni. Modern visitors that would like the ease of finding a hotel close by, book a room in the Residenza d'Epoca Relais Campo Regio or Palazzo Coli Bizzarrini. Peretola Airport is a primary arrival point for flights, and is 75 miles (117 kilometers) from San Casciano dei Bagni's downtown area. Travelocity-listed hotels nearby include The St. Regis Florence and The Westin Excelsior, Florence. Colori DI Aurora 8+1 Sleeps, Villa With Private Pool at Exclusive Use! 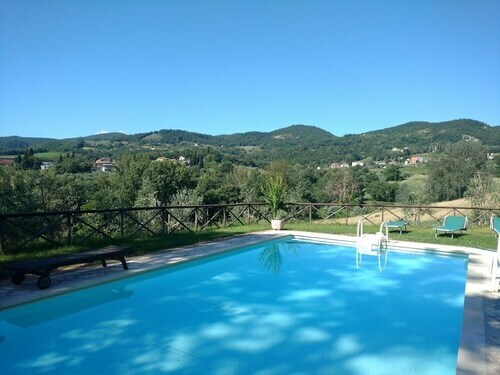 Amantino 8 Sleeps, Villa With Private Pool at Exclusive Use! Podere Collelungo 14+1 Sleeps, Villa With Private Pool at Exclusive Use! Villa DEL Dottore 12+4 Sleeps, Villa With Private Pool at Exclusive Use!